In order to protect the data inside your ONTRAPORT account, it’s important to have your team members use their own unique login. Therefore, you create Roles, limit each Role’s ability to access certain parts of the system, and then add Users to each Role. After that, you'll set which Roles report to whom. A Role is not created for each type of team member, or "User", logging in. 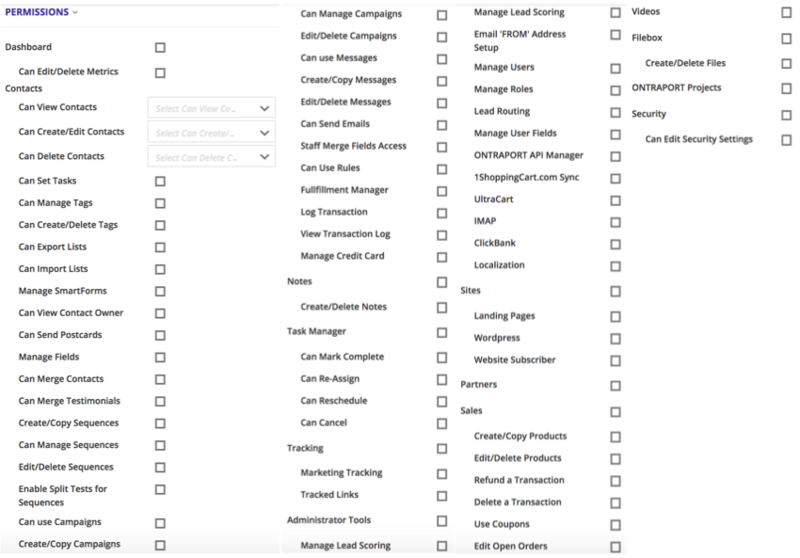 Make Roles for each category of User such as sales rep, manager, or customer service representative. Then, you'll set permissions for each Role, assign the Users to the Role, and the Users will inherit the permissions in that manner. A new account starts with just one role – Administrator – who has permission to do everything in the system. ONTRAPORT Basic accounts have only one User, the Administrator, and do not need to consider the rest of this article. Type in the name of your new role,i.e. sales rep, customer service rep, designer, etc. Now, whenever someone tries to log into that account from a new IP address a "Restricted" notice will pop up with a button to authorize that IP address. Clicking that button will send an email to that User; responding to the email from the same IP address will validate that IP address. Note: this will happen the first time you try to log in after selecting the Enable IP address restriction check box. The User must have a valid email address for this option to work. You can edit the allowed IP addresses by clicking the profile icon at the top right of the account, selecting Manage Users and editing the User. Edit a Role - To edit a Role, click on the name of the Role in the Roles collection. 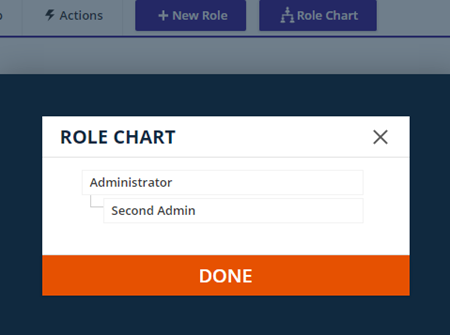 View the Role hierarchy tree - To view this, click the Role Chart button. Create groups - To create groups based on Roles and Role managers, click the Manage Groups button.